This is part two of a #food label “cheat sheet.” Keep in mind, this cheat sheet doesn’t tell you everything you should know, but at the very least it will give you some of the key elements. Also, it’s important to note that all these label items are based on a standard serving size called the Reference Amount Customarily Consumed, or RACC, which may or may not be the same as your personal serving size. #Nutrient Recommended Daily Value, based on a 2,000 #calorie #diet. (You can determine your calorie needs here.) All of these might not be included, generally they’re not; however, many are required to be on the label by the Food and Drug Administration. 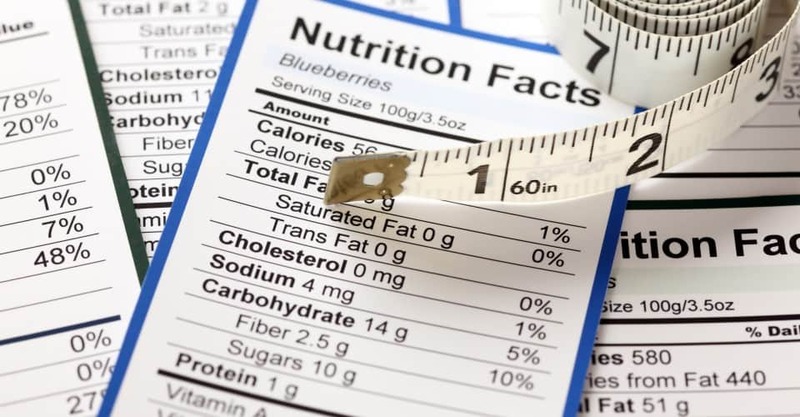 Why It Matters: The food label indicates how much of these nutrients is contained in a single serving of the food relative to what the FDA has determined to be the recommended Daily Value (DV) or the average need of the “typical” consumer — although this can vary depending on an individual’s weight and gender. This is really helpful if you want to get a quick assessment of whether you’re eating too much or too little of a nutrient. For instance, a food that has a Daily Value of 20 percent for fat per serving provides 20 percent of the daily requirement for fat in a single day. You should not exceed 100 percent of the Daily Value. Here is another example: If the recommended Daily Value for sodium is 2,400 milligrams, and a serving of cereal provides 240 milligrams of sodium, the cereal’s DV for sodium would be 10 percent. Also, keep in mind that 5 percent DV or less is low for all nutrients, including those you want to limit (e.g., fat, saturated fat, cholesterol and sodium). Also, these Daily Values are based on estimates for someone eating a 2,000–calorie diet and, therefore, may not apply to you. The FDA is currently reviewing nutrient Daily Values (DVs), most of which are still based on recommended dietary allowances (RDAs) established in 1968. A lot has changed since 1968 in terms of nutrition research. Total fat = 3 grams or less per serving/RACC (Reference Amount Customarily Consumed), or, for meals and main dishes, 3 grams or less per 100 grams and not more than 30 percent of calories from fat. Saturated fat = 1 gram or less per serving/RACC and 15 percent or less calories; for meals and main dishes, 1 gram or less per 100 grams and less than 10 percent of calories from saturated fat. Beneficial nutrients = Contains at least 10 percent of DV per serving/RACC for vitamins A, C, calcium, iron, protein or fiber except: raw fruits and vegetables; frozen or canned single–ingredient fruits and vegetables; at least 10 percent of the DV for two of the following: vitamin A, vitamin C, calcium, iron, protein or fiber for a main dish, or of three for a meal. Why It Matters: When you see the term “healthy” on the label you can have a certain level of confidence that the food meets these requirements. One interesting note: Even if the word “healthy” appears only in the name of the product (such as Healthy Choice), it must meet these requirements. “Good Source”: One serving contains or provides 10 percent to 19 percent of the DV per RACC for the indicated nutrient. The term may be also used on meals or main dishes to indicate that the product contains a food that meets the definition. Example: Good source of fiber: Contains 10 percent to 19 percent of the DV for fiber (2.5-4.75 grams per serving). “High,” “Rich In” or “Excellent Source Of”: Contains 20 percent or more of the DV per RACC for the indicated nutrient. May also be used on meals or main dishes to indicate that the product contains a food that meets the definition. Example: High source of fiber: Contains 20 percent or more of the DV for fiber (at least 5 grams per serving). Why It Matters: This is especially important for some nutrients and vitamins, such as fiber, vitamin C, potassium and protein. When you see these terms on the package you can have a certain level of confidence that the product meets these requirements. Lean: This claim may be used on seafood or game meat products that contain less than 10 grams total fat, 4.5 grams or less saturated fat and less than 95 milligrams cholesterol per RACC and for meals and main dishes that meet these criteria per 100 grams or per labeled serving. It can also be used on mixed dishes not measurable with a cup that contain less than 8 grams total fat, 3.5 grams or less saturated fat and less than 80 milligrams cholesterol per RACC. Extra Lean: May be used on seafood or game meat products that contain less than 5 grams total fat, less than 2 grams saturated fat and less than 95 milligrams cholesterol per RACC, and on meals or main dishes that meet these criteria per 100 grams or per labeled serving. Why It Matters: Seeing this claim on meats or frozen foods allows you to be confident that the food meets the labeled criteria. One interesting note: Even if the word “lean” appears only in the name of the product (such as Lean Cuisine), it must meet these requirements.